Review: Dallas dudes Dolphin Records have largely impressed since launching at the tail end of 2016, largely by delivering releases that explore the outer reaches of jazz, funk, soul and psychedelia. 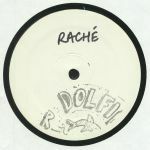 On this 12", they present a slew of fresh re-edits of tracks from one of their finest LPs to date, Rache's eccentric, free-jazz-with-house-influences set Halepenos. Seven Davis Jr is the man at the controls for much of the EP, first provided a deliciously wonky, slipped P-funk meets-J Dilla-via-Mo Kolours take on "Call This Something" before unfurling a super-dusty, hypnotic deep house version of "Take Tayke". Arguably even better is the lo-fi, sub-heavy deep house soul of Davis's "Plugged Up" interpretation, while Rache member Ben Hixon's re-edit of "Socks Soxxx" is a skewed, mind-altering deep house bumper.